Fit Fluential Mom: Veteran's Day Freebies for 2011: Tons of freebies for Vets & their families to enjoy! Veteran's Day Freebies for 2011: Tons of freebies for Vets & their families to enjoy! Please note you will need to show your military IDs at all participating locations to receive the freebies. It's a good idea to also call ahead to be sure your location is participating. You can also click the links to each offer to see all the details. Sea World, Busch Gardens and Sesame Place offer free admission to active duty military and up to 3 dependents once a year. The National Parks Service will not charge entrance at more than 100 national parks this Friday through Sunday Nov. 11-13. Sleep Number, the adjustable mattress chain, is offering a free cotton travel pillow to military personnel who visit their store on Friday. See link for locations. Famous Dave's is offering a FREE meal to military personnel today, Nov. 11, 2011. Selection varies by state. 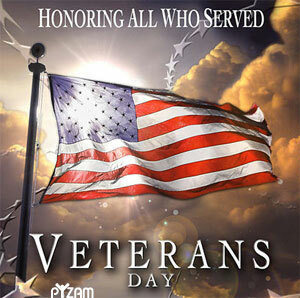 Subway is offering a free 6 inch sub to military personnel on Veteran's Day, Nov 11, 2011. Call your local location to ensure participation. 7-Eleven is offering a free small Slurpee drink on Friday November 11th, 2011 to all active, veteran and retired military members and their immediate families between 11am - 7pm. BJs Restaurant and Brewhouse is offering a complimentary lunch entree or a one topping mini pizza for dinner. Offer valid to all active duty military and veterans with proof of ID. McCormick & Schmidts is offering a special Veterans Appreciation Event with a complimentary entree Sunday, November 13th. Reservations are recommended and space is limited. Sizzler Restaurants - Buy one get one free 6 oz steak entree with proof of military service. A Fun, Rainy Day Experiment!